that a sweet looking stove. Too bad you are gonna have to feed it matchstick size logs every fifteen minutes. Just put a piece of tamarack in it and walk away for 24 hours assuming the plate on the bottom and sides is thick enough not to burn through. ...or charcoal every 5 hours. Why get a huge woodburner unless it's really needed? 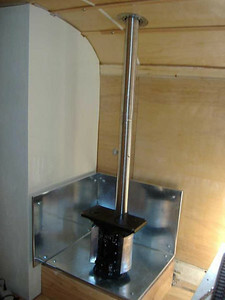 Not a problem, the purpose of the stove is to cut the edge off of the cold not heat the bus like I was on the equator. I'm the sort of guy that sleeps with the window cracked in the middle of winter. That's what quilts and blankets and a warm wife is for. Besides good a hardwood fire will keep heating up the space for 6-8 hours if it's bank properly....a boyscout trick.